Only just started, i recently scrapped another project that i was working on so i could start this one! I will update most graphics and game play here but most of the programming is done! Would really appreciate it if you guys could pitch in with a few ideas on what you would like to be in the game and even a new name for the game (Hero of Wind is only a temporary title). 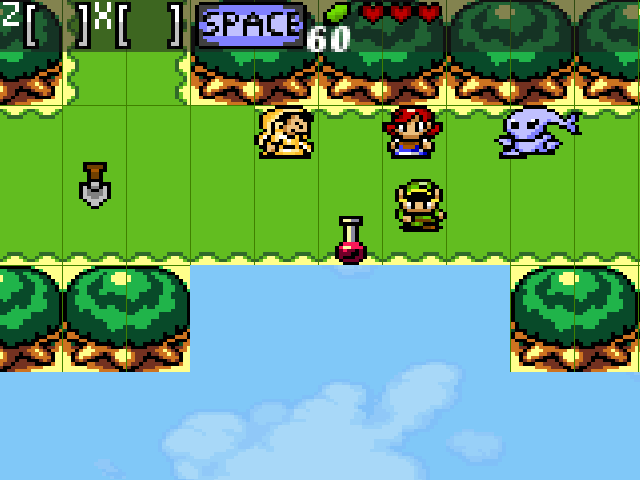 The Game will be featuring Links Awakening Graphics (edited obviously) and will have well known characters from the universe (Tingle, Anju, Zelda). The story at this time revolves around the discovery of a race that lives on the land below (below the sky-lands) and will become accessible once you attain a loft-wing (similar to skyward sword). Link called by the Triforce (as a whole) will bring him to a temple (of the ground or sky [to be decided]). And hence he takes on a quest given to him by the Triforce (inspired similar to the oracle series in the Triforce Test). The land of the sky will be slightly smaller to what lies below, the sky-lands will feature a more bright color pallet and the land below will be more dark and mysterious. I Hope to create a deep story and am also asking for the communities regard to help add to the story and overall feel of the game. This page was last modified on 17 May 2013, at 13:12.